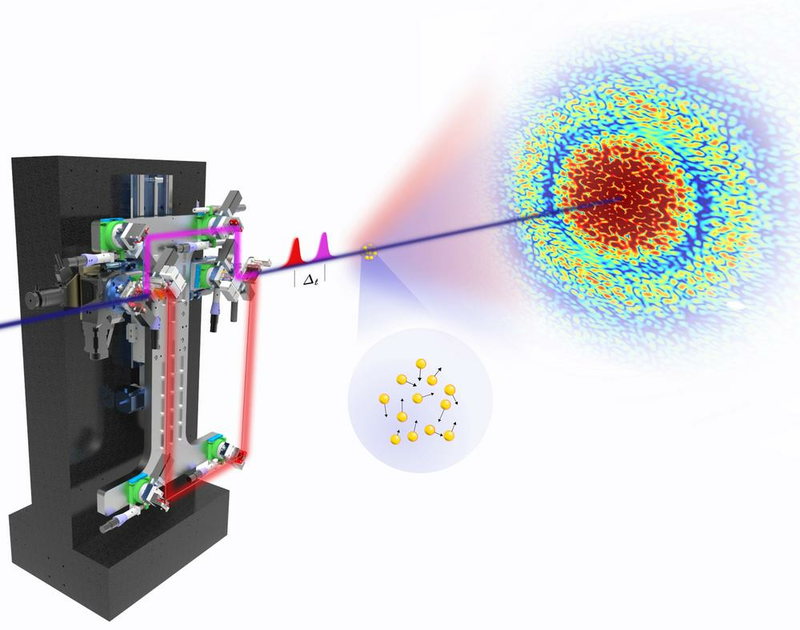 A team of scientists from DESY, the Advanced Photon Source APS and National Accelerator Laboratory SLAC, both in the USA, have developed and integrated a new method for monitoring ultrafast movements of nanoscopic systems. With the light of the X-ray laser LCLS at the research center SLAC in California, they took images of the movements of nanoparticles taking only the billionth of a second (0,000 000 001 s). In their experiments now published in the journal Nature Communications they overcame the slowness of present-day two-dimensional X-ray detectors by splitting individual laser flashes of LCLS, delaying one half of it by a nanosecond and recording a single picture of the nanoparticle with these pairs of X-ray pulses. The tunable light splitter for hard X-rays which the scientists developed for these experiments enables this new technique to monitor movements of nanometer size fluctuations down to femtoseconds and at atomic resolution. 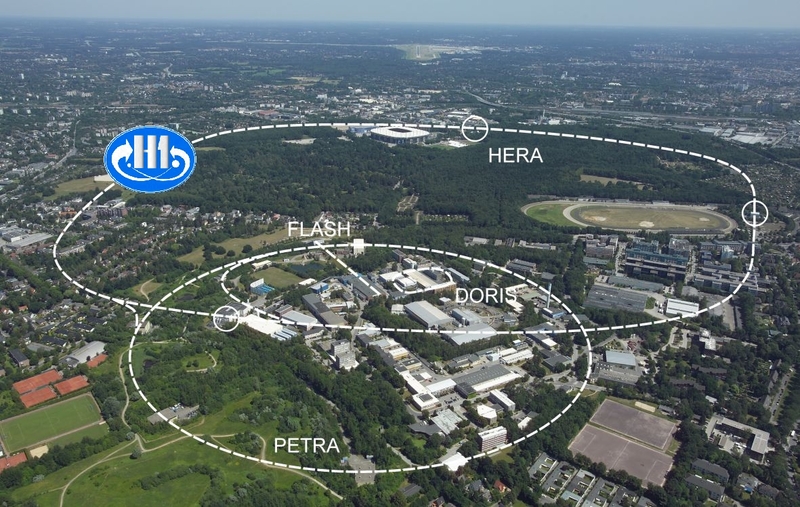 For comparison: modern synchrotron radiation light sources like PETRA III at DESY can typically measure movements on millisecond timescales. Scheme of the experiment: An autocorrelator developed at DESY splits the ultrashort X-ray laser pulses into two equal intensity pulses which arrive with a tunable delay at the sample. The speckle pattern of the sample is collected in a single exposure of the 2-D detector (picture: W. Roseker/DESY). he intense light flashes of X-ray lasers are coherent which means that the waves of the monochromatic laser light propagate in phase to each other. Diffracting coherent light by a sample usually results in a so-called speckle diffraction pattern showing apparently randomly ordered light spots. However, this speckle is also a map of the sample arrangement, and movements of the sample constituents result in a different speckle pattern. For their experiments the researchers developed a special optical setup – a so-called optical autocorrelator – capable of splitting 100 femtosecond long XFEL pulses into two sub-pulses, deviate them into separated detours and recombining their paths with a tunable time delay between zero and a few nanoseconds. These pairs of XFEL pulses hit the sample with the tuned delay, spotting the sample´s structure at the two exposure times. The sum of both speckle pictures was recorded by a two-dimensional photon detector within one exposure time. The trick: If the constituents of the sample move during the two illuminations, the speckle pattern changes, resulting in an integrated picture of less contrast at the detector. The contrast is a measure on how strong the photon intensity varies on the detector. However, the intensity and especially the intensity difference measured at the detector are very weak. In their experiments the researchers had to work with only some 1000 detected photons on the one-million-pixels size detector. In their work the researchers around Roseker used a suspension of two nanometers size gold particles undergoing Brownian motion. The experiment was in perfect agreement with the theoretical predictions thus proving not only the performance of the autocorrelator setup but also the validity of the data analysis procedure, demonstrating the first successful experiment of this kind. One of the challenges in this experiment, carried out at the XCS experimental station at LCLS, was to autocorrelate thousands of extremely weak double shot 2D images which was achieved with the help of a newly developed maximum likelihood analysis technique. “This experiment paves the way to dynamics experiments of materials on atomic length and femtosecond-nanosecond timescales,” explains Gerhard Grübel, head of the DESY FS-CXS group. “Split-pulse X-ray Photon Correlation Spectroscopy (XPCS) can potentially track atomic scale fluctuations in liquid metals, multi-scale dynamics in water, heterogeneous dynamics about the glass transition, and atomic scale surface fluctuations.” Additionally, time-domain XPCS at FEL sources, especially at the European XFEL, is well suited for studying fluctuations in non-equilibrium processes that go beyond time-averaged structural descriptions. This will allow the elucidation of dynamics of ultrafast magnetization processes and can address open questions concerning photo-induced phonon dynamics and phase transitions.